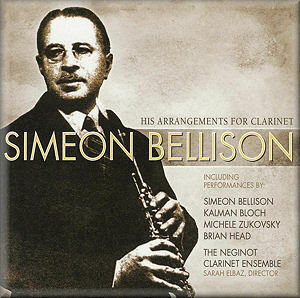 Simeon Bellison will be remembered by many as the principal clarinettist of the New York Philharmonic-Symphony, to which role he was appointed in 1920. He held the position for nearly thirty years, finally resigning in 1948. He’d been born in Moscow in 1883 and became first clarinet in the St. Petersburg Imperial Opera orchestra in 1915, later starting a Zionist-sponsored ensemble with which he toured internationally before leaving Russia for the United States. He played chamber music extensively and taught and wrote many arrangements – and it is these that form the spine of this characterful disc devoted to him. In terms of his discs I particularly remember the 78s of the Mozart Clarinet Quintet K581 that Bellison recorded. But he recorded smaller things too and fortunately Summit Records has chosen to open this disc with a couple of examples of Bellison himself. The Beethoven variations on Don Giovanni show his wit as well as his legato. We can appreciate his timbre and colouristic sense as well from the arrangement of Tchaikovsky’s Autumn Song. Both these (undated) recordings are accompanied by Julius Chajes. The rest of the disc is devoted to Bellison arrangements and/or to pieces strongly associated. It’s good to hear Grzegorz Fitelberg’s music, modest though these two Chassidic pieces may be. Far better known now as a conductor he did compose quite extensively. Weinberg’s two Chassidic dances are equally compact but they’re wittily played and there are some fine dynamic nuances at work in the Canzonetta. Srul Glick was active as a composer in Canada and his Suite Hebraic is warmly lyric. Alexander Krejn has received intermittent attention from record companies, mainly for his violin music. Bellison was a frequent interpreter of his music. The Three Hebraic Sketches are performed by clarinet and string quartet and emerge as very warmly moulded pieces. The central movement has some animating pizzicatos and a Chassidic clarinet-led declamation whilst the finale is in looser rather folkloric style alternating with more formal clarinet quintet textures. The remainder of the programme ranges principally over the clarinettist’s Russian roots. There are plenty of opportunities for virtuosic flourishes – such as the Pugni – and there’s a Hausmusik example in the shape of the clarinet and guitar arrangement of the Schubert. The ultimate arranger, Brian Head, plays guitar. We end with a mass clarinet choir recording of Bellison’s arrangement of the Air on the G string, as it’s now never known – probably rightly in this context. Kalman Bloch is the father of Michele Zukovsky and they are the soloists, aided by their fine collaborating colleagues. Recording locations and dates are not noted in the fold-open booklet. All performances are thoroughly idiomatic, engaging and vital.